Any day now I will have a new little nephew in my family. My older sister told me she was expecting her second back in November, and I could not have been more excited. She already has an almost two-year old daughter and since this child is her last I was really hoping she’d have a boy. And man was I excited when we found out she’d have one of each! Since her babies will be sharing a room for now, my sister decided to re-use the safari theme for this baby so that everything new would match all the old decorations that are already in the room. And because Chris and I are both huge fans of Disney, I knew that The Lion King would be the perfect tie in to her already put together nursery! 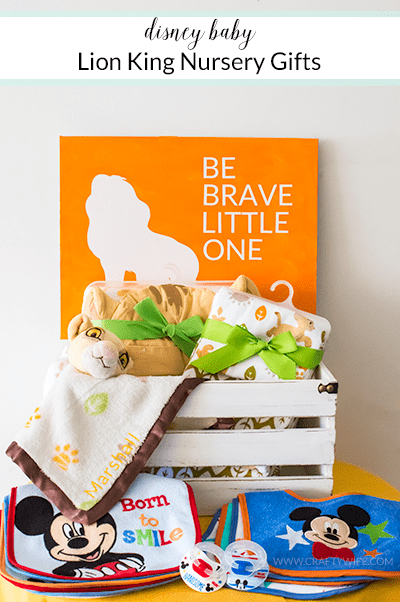 So, I set out to make two unique and customized gifts for the new little one using a few items from the Disney Baby Lion King collection at Walmart! As a child, I always loved when Rafiki painted the small lion cub on the tree. For some reason that scene always stuck with me, and so I wanted to channel that and make the paint on my canvas look a little messy. Using a foam brush I went back and forth on the canvas until I achieved the look I wanted. This was my first attempt at a Lion King canvas, and because the paint is so dark you can really see the “messy” strokes I made. I then cut out my vinyl design with the Silhouette and removed the excess vinyl leaving only the design on the backing. You want to keep the design on the backing so that it will line up properly once you try to put it on the canvas! Place your contact paper on top of your design, smooth it out, and then remove the backing. Then lay the design on top of your canvas and remove the contact paper leaving only the design on the canvas. Paint a very light layer of mod podge on the canvas to seal the vinyl and then let it dry for about 24 hours before you hang it on a wall. 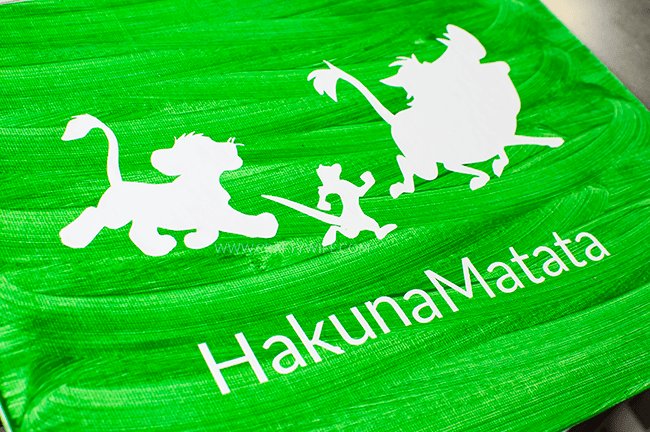 In addition to the wall art I also made something a little more customized for the new baby, and decided to personalize one of the Lion King Blankets I found! With your Silhouette Designer Software, type out the name of the child and mirror the image. Feed your heat transfer vinyl into your machine (consult the manual on how to do this), adjust the settings, then click cut. Once you’re done cutting the vinyl pull the excess vinyl off the backing of your paper so that only your design remains. It’ll look like this. Turn your iron on and set it to the cotton setting. Once it’s heated place the vinyl where you want it on the blanket, put your pillowcase on top to protect it, and then press down with your iron for 60 seconds. You may have to do this more than once until the vinyl sticks properly! Then, pull the clear paper off the top of the design. Now you’ve got your very own customized baby blanket! I cannot wait until my sweet little nephew is born so I can give him these gifts! And they are even sweeter because they’re custom and I was able to put so much love and work in to each of them. If you want to shower a baby your know and love, you can pick up more Disney Baby products at Walmart in the baby section! I had a hard time finding a lot of Lion King items, so if that is something you want to decorate your nursery with there are so many more options online! Of the three Walmarts I went to I found more Mickey, Minnie, and Winnie the Pooh items than anything else. But that’s probably because those are three incredibly popular Disney nursery ideas! Do you have a sweet little one in your life? Which Disney character from Walmart would you pick to shower them with? Thank you, Michelle! It ended up working out so well and my sister loved everything which was great! This is adorable! First, I love that you made the wall art! I keep saying I want to make some myself, and I never do it. 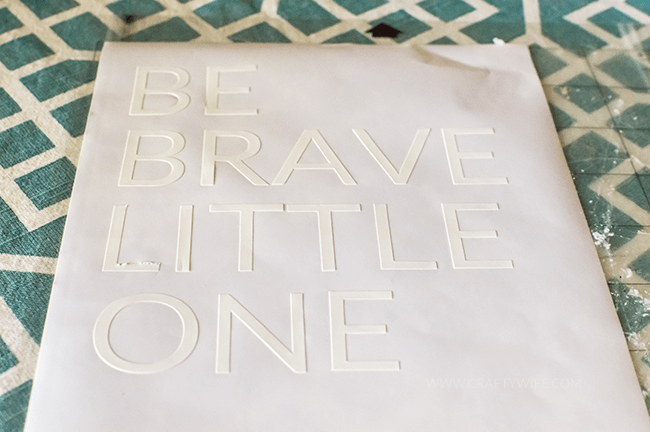 Have you made any for your nursery? Thank you! I haven’t done it for myself yet, I need to! The problem is I can’t decide what I want to make first. haha Are you going to make some for a gallery wall? That would be another fun project to tackle!